Have you ever thought about Kyoto? The Kyoto Protocol is an active treaty that was put into effect on February 16, 2005 as an addition to the 1992 United Nations Framework Convention on Climate Change. The primary concept behind this treaty is to reduce the global production of Greenhouse gases like CO2, which as we have learned in class is a primary concern for the global rise in temperature. One of the problems with the Kyoto Protocol are that it does not do enough to address CO2 and other Greenhouse gas emissions because it does not establish limits on the output of emissions in developing countries. While the initial 30 countries that signed the treaty are needed for the purpose of maintaining or stabilizing CO2 sinks, preventing expanses of emissions in developing nations like China and India is extremely important. Without such restrictions addressing important topics like Carbon Trading and population growth, effective global regulation is not possible. Instead, this treaty actually pushes greenhouse gas emissions from one location on the planet to another as businesses have the ability to move high polluting manufacturing processes to countries where developing new sources of pollution would not be highly regulated. Additionally, this treaty does not effectively calculate the cost of growing populations, and in fact does not regulate India and China in an effective manner to balance these nations consumption under populations that are growing at an exponential rate. The fact, these nations which combined population exceeds 1/3rd of the world’s population yet as nations their participation in Kyoto protocols came without binding emission targets. Many people believe that because the Kyoto Protocol does not do enough to address CO2 and other GHG’s, includes weak measures in regulating Carbon Trading and does not address factors of population growth, this treaty does not bring effective measures that balance GHG emissions on a global level to justify participation by the United States. The Kyoto Protocol, while achieving amazing levels of cooperation amongst nations did not effectively establish Global reduction of Carbon Emissions. In fact, a variety of conditions under which the Kyoto Protocol was established have significantly changed, especially in the areas of manufacturing and pollution discharge. These increases are in part because these regulations allowed manufacturers to move their operations to these nations where emissions are unregulated. In order to produce a standard that works on a global level to achieve and maintain a permanent reduction of inorganic atmospheric greenhouse gasses – which include carbon dioxide (CO2), methane (CH4), , hydrofluorocarbons (HFCs),and other gasses into the atmosphere, all nations must find these regulations apply universally so that manufactures and corporations must fall into equal compliance. In fact because the provisions allow for carbon trading, the primary methodology behind these provisions is flawed. Not only will there be financial advantages to trading that will will allow underdeveloped nations to increase their gas emissions, increasing global output, but by ‘trading away’ their emissions, more developed nations could instead shift the location of production and could potentially further increase the overall global output. This is not just a fear. In fact China can be used as a primary example. According the the Dag Hammarskjold foundation, “the most fundamental point to note about carbon offsets is that they increase global emissions rather than decrease them” The reasoning behind this is that “ even if ‘emissions reduction sold by an offset project developer could be verified as successful, any gain would – by definition be nullified by increased emission allowed to the buyer, delaying the transition to a post – fossil fuel economy elsewhere. If every project were designed and implemented perfectly, the net result would be to move emissions from one place to another with no net reduction.” Carbon Trading How it works and why it fails “ Nov 2009 Essentially the concept of carbon trading allows for a major polluter to avoid significant and lasting changes to their facilities. Instead they are riding the coattails of those who are producing minimized pollution by “buying” the amount of pollution the newer facility didn’t create. There are two negative behaviors associated with Carbon Trading. The primary one,is that high polluting factories avoid cleaning up after themselves by bearing the financial burden and potential shutdown times by retrofitting factories or changing out machinery for less polluting models. This practice offsets pollution in one high pollution area and credits global areas of the southern hemisphere that are underdeveloped. In fact, this practice forces nations into a continued poverty based on the need to retain areas of the planet that are still healthy and full of vital life. A secondary impact of Carbon Trading is the effort to push disruptive and unnecessary projects in communities that may not need them. One example of such is a case in Thailand where A.T. Biopower wanted to create 5 biomass factories to use rice husks for energy development so Japan’s Mitubishi UFS Securities and Chubu Electric could create Carbon offsets. In this example the movement of people protected their land, rivers and local need for the proposed alternative use of rice husks which is used for animal beds and a staple of compost to provided needed filler for blending with animal wastes. Meanwhile, The United States is establishing amazing standards imposed upon the Green Revolution of the 1960’s and 70’s. Programs like the multiple revisions to the Clean Air act, National Ambient Air Quality Standards (for ozone and particulate matter the Clear Skies Proposal as well as others, are already working. “In the case of particulate matter (PM), EPA has also been working hard to provide States with appropriate tools and guidance to implement the 1997 air quality standards. According to Congressional Testimony “ – these standards will define the further reduction and implementation of matter that were not covered in earlier policy like the: the Clean Air Interstate Rule (CAIR), Clean Air Mercury Rule (CAMR), and Best Available Retrofit Technology (BART) as well as establishing guidelines based on “ reasonably available control measures (RACM); reasonably available control technology (RACT); and a policy on PM2.5 and precursors such as SO2, NOx, VOC, ammonia, and direct emissions (including organic carbon, elemental carbon and crustal material); “ These standards will continue to phase out unfiltered GHG Emissions that regulate American consumption much more rigorously than standards established by other nations. In fact the conditions in the US are improving. “On October 5, 2009, President Obama signed Executive Order 13514 on Federal Sustainability, setting measureable environmental performance goals for Federal Agencies. Each Federal Agency was required to submit a 2020 GHG pollution reduction target from its estimated 2008 baseline to the White House Council on Environmental Quality and to the Director of the Office of Management and Budget by January 4, 2010 Because President Obama made a commitment to reduce active emissions of greenhouse gases within United States by 28% by 2020. It is perceived that this will additionally establish future employment opportunities through the construction of new infrastructures and scrubbing technologies. But does this really make a difference? As the United States is actively facing areas of drought in major food production areas of the southwest, talk of faltering infrastructures come up time and time again. Had the United States signed on to the Kyoto Protocol when it was first ratified by the world, how would aspects of our infrastructure remain the same, or change? Would there be more train stations, would recycling programs be more effectively supported so as to reduce materials manufacturing costs to reduce pollutant contaminants and CO2 emissions? Would there be more sustainable practice education and access? Would businesses like coffee shops, gas stations and fast food restaurants charge for the carbon cost of plastics and waste materials? Would recycling be the law of the land where US based systems processed the materials instead of sending virtually all plastics, precious metals and e-wastes to third world countries? We will never know what could have been, but – if you have followed this blog you already know how bad it’s getting. Just some food for thought. Water quality in the United States may be one of the most understated concerns facing future generations. As the spread of human development continues to grow, the concerns and understanding of maintaining a vibrant and consumable water supply chain continue to push their way to the forefront of society and governmental concerns. As Americans we do many things to put our water at risk of being safe for our planet. While oil spills, hazardous waste and major contaminants like sewage are items that bring recognition to most peoples consciousness, especially when concerning the impact to drinking water, this is not the case for one of most common daily sources of pollution to our open water sources. These contaminants, known as Non Source Pollutants (NSP’s), threaten to destroy our lakes, streams and watersheds on a consistent basis. According to the Environmental Protection Agency (EPA), the direct street to stream aspect of storm-water runoff and is one of the primary culprits of this growing pollution source and education is one of the most valuable solutions for solving this problem. Non Source Pollutants are the wide range of incidental chemicals and elements that end up in natural watersheds through particulate collection of materials by water as it travels from humanized environs to natural biospheres. The incidental nature of NSPs are at the core of the dangers they represent. According to the EPA, “The term “nonpoint source” is defined to mean any source of water pollution that does not meet the legal definition of “point source” in section 502(14) of the Clean Water Act. (EPA, web). The secondary primary aspect of this water is that it is not processed by municipal water treatment facilities. According to Aurora, Colorado Water’s website, “In an urban setting these (NSP’s) include: pesticides and fertilizers, automotive fluids from leaks including oil and antifreeze, as well as a wide variety of chemicals that are leaked or spilled within our communities.” (Aurora Water, web). These chemicals are generally absorbed by water during precipitation and flow through storm water systems to open source water where the contaminants can gather and have a greater impact on their surroundings. Additional items considered NSP include bacteria, viruses and trash or litter. According to the National Oceanic and Atmospheric Administration (NOAA), NSP pollution can have negative impacts on the economy through: shipping issues, tourism, and available foodstocks. To solve the impacts of both chemical and litter pollution from impacting storm-water runoff directly, governments have established a wide variety of solutions to directly counter the variety of sources that fall under the NSP category. The internet has become an extensive resource for providing general access to educational resources for a wide variety of community solutions. These range from ready to print flyers and classroom modules to details of infrastructure improvements and plans that impact collection and capture of water. In addition, special collection days and community activities like litter remediation continue to prove valuable techniques in reducing the quantity of NSP’s in our storm-water systems and natural waterways. As the demand for water increases in urban communities like Aurora, concerns for development of additional water collection are under active consideration. The Prairie Waters Project (PWP) is an example of one such project. This project will divert river water from the Platte River where it will be transported and then processed for consumption before being returned to sources downstream or away from the of the collection point. It is important to note that much of the water will have come from storm-water runoff that is naturally filling the South Platte River. It is important to consider that this water will have NPS’s contaminants from farms, forests, animal and rural activity upstream of the collection point. Besides transporting elevated nutrient content and suspended sediments, bacteria and viruses may be in the water being transported. In the map of the PWP’s infrastructure plans, it is important to note that part of this system includes a storm drain bypass that will feed directly into the Aurora reservoir. This presents potentials for elevated levels of contamination as storm-water runoff could contaminate the reservoir itself. To alleviate these risks, monitoring of water quality at both the Platte River and along the Storm Drain Bypass Extension will have to maintained as well as increased monitoring of potential sources of pollution upstream whose activities could change classification status to ‘Source Point’ pollutants. In addition, it will be necessary to monitor the ways that new NSP nutrients will impact the overall health of the Aurora Reservoir. to the varying nature and impact of Non-Source Pollutants on our water system, as well as the wide array of possible initial sources, non source pollutants are a danger to natural ecosystems as well as viable groundwater sources for human consumption. Their impact on the environment can be hard to directly measure as these pollutants accumulate over time generally on non permeable surfaces and generally accumulate during a precipitation event. Because these events are varied and are not regulated, the frequency at which they occur and the rates they introduce accumulated pollutants is hard to capture or resolve. This causes the primary methods of monitoring watersheds, maintaining riparian zones for diffusion of pollutants as well as education processes and active community efforts to limit and control non source pollutants in urban areas necessary practices. I believe the monitoring of watersheds and potential source points is expected to expand as our society grows. Understanding how this need will expand or need to be intensified for downstream communities will be a problem that will likely continue to grow. “Aurora – Prairie Waters Project.” Aurora – Prairie Waters Project. N.p., n.d. Web. 07 Nov. 2013. “National Institute of Environmental Health Sciences.” Bisphenol A (BPA). N.p., n.d. Web. 07 Nov. 2013. “Nonpoint Source Pollution.” NOAA’s National Ocean Service Education:. N.p., n.d. Web. 07 Nov. 2013. 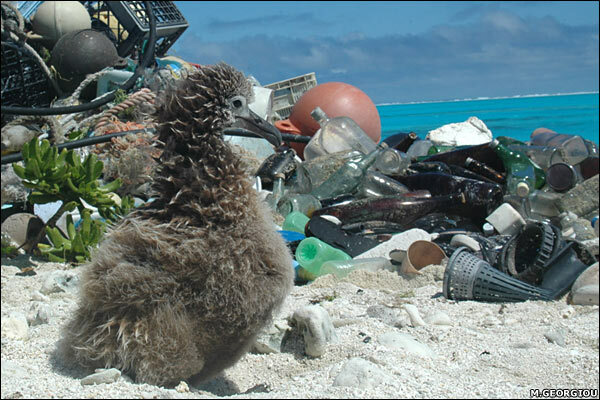 Have you heard that a 19 year old has made a presentation about cleaning up plastic from our ocean? If you haven’t I have to tell you that this Ted talk is worth watching. If there is one thing I hope you walk away with from watching his presentation – its that you contribute to plastic pollution without thought or intentionality. His video a real problem for our planet. I hope that you are so moved by this young mans ideas that you begin to realize how big of a problem we have made by the thoughtless ways we are habitually destroying our planet. 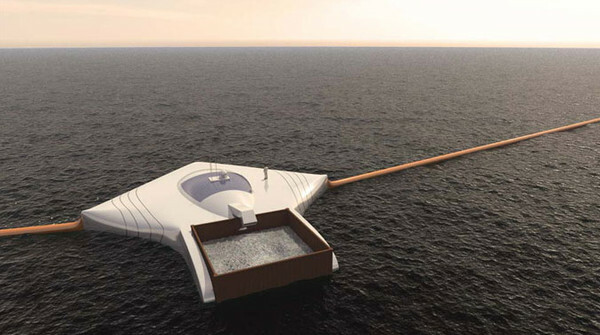 Does Boyan Slat have a good idea? YES, YES he does. His idea is amazing, use the motion of our planet’s oceans to clean up the mess we have made. Sounds good to me. Is the idea to clean our planet in a manner of 7 years realistic? No, not really. The first and most basic reason is that the time to build his theoretical machinery could take a decade just to build. There are some concerns in how machinery could remove plastics that are known to be suspended up to 90 meters below the ocean. An additional concern for this particular project focuses on the dangers that occur when you add physical materials directly to the ocean that weren’t there to begin with. In the case of the plastics themselves, we already know that they leach chemicals into the ocean. How would a new material added to the ocean impact life? One answer is that life will begin to develop under and around the introduced product. We know this is true because there are multiple examples of efforts to build and grow habitats using man made structures. Below is one such example, from attempts to regrow corral reefs in Florida. 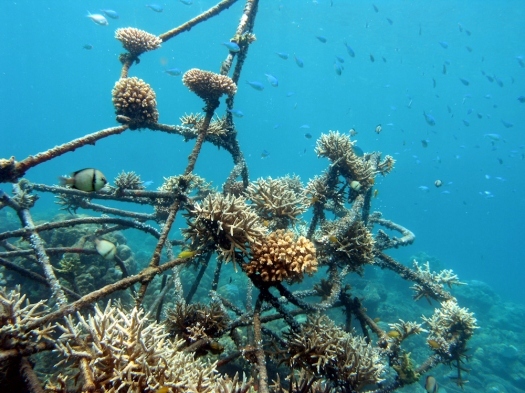 This blog from the Scuba Divers Travel Network discusses many areas regarding the efforts of rebuilding the reefs as well as many global concerns for our oceans. But the truth is, I don’t believe this solution is the end all be all to ‘saving our planet’ from ourselves. I don’t think that this well intentioned and idealistic man really intended to misrepresent his ideas as an end all solution to plastic pollution in our oceans. Unfortunately, this is what has been happening. Because I’m into telling people about plastic pollution in the ocean, I often feel that I’m the first person that people run to when they first hear of this concept idea. The truth is, that it would take a massive fleet of ships, ones that are stationary – one that are actively moving about our gyres to clean them. If you have followed my posts you know that there are reasons for Plastic warriors to unite! The reality is that all of our planets oceanic systems are being clogged at the arteries with plastic and we are approaching a time when active remediation will be required for life to survive. 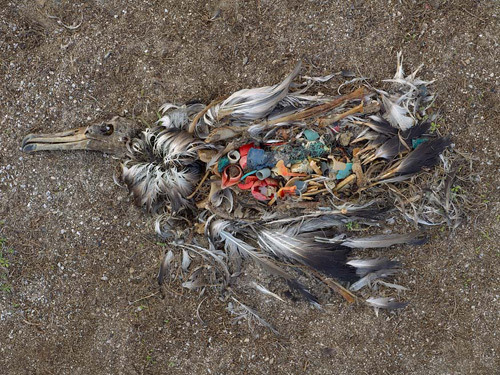 These sad truths are represented in studies like this one by Dr. Jennifer Lavers, shows that birds are not only eating plastic, but that they are becoming weak from the leaching of contaminants into their bodies. As a person who daily preaches the dangers of our addiction to plastic, I have been aware of the problems facing our planet and I communicate them regularly in all I do. I ask the waitress or bartender to not bring straws to the table, or to be used in a beverage delivered to the table. I bring my own bags to the store, or I grab used bags from the recycling bin. In fact there are many times that flat out refuse a bag, or specifically request paper bags. But that’s my story about my personal activism. In my experiences, the majority of people don’t really think about how we consume, or what happens when this consumption is over and the materials end up outside in a rubbish or recycling bin. In an earlier blog I discussed the advantages of setting up a second waste can for recycling. Those who do find that this one act changes both their awareness and effective recycling rates! Why do we want to change these rates? Because materials consumption is at a rate greater than anytime previous in our history. This poses problems as we are consuming materials at a rate greater than our planet can support. The cost of industry is pollution. This pollution comes in the form of CO2 emissions, foreign materials in our water supply, spills and fires from oil. This trend isn’t going to end any time soon. This is why it’s so important to recognize that each individual action we take today, impacts the ability for us to fix things in the future.